To become an “Air Hostess” is like a dream come true for the young girls. Flying is the dream of everyone. And if you have the option to choose your dream as your profession! What you will feel? It’s amazing. By the growing scenario of the aviation industries across the world, the professional education courses exist in India to produce the air hostess and flight steward. The air hostess is the primary career line of an airlines career. This career involves in pleasant, friendly and enthusiastic personality and environment. Get Latest Career Notification about Air Hostess Courses, by entering your details below. The courses leading to the air hostess and flight steward are the programmes under the ‘Aviation and Hospitality Management’. Air hostess is also known as the Flight attendants or cabin crew, stewards/stewardesses or cabin attendants. The German Heinrich Kubis was the world’s first flight attendant, in 1912. The first female flight attendant was 25-years old Ellen Church employed by United Airlines in 1930. Air hostesses are expected to be smartly dressed and well groomed at all the times. Most of the airlines do not allow the air hostess to have visible tattoos or piercings. Air hostess are required to work with a variety of people from different backgrounds and cultures. Greets the passengers and guides them to settle down in their seats. Answering passenger questions during the flight. Serving meals and refreshments to passengers. Provides medical care to the passengers if needed. Instruct passengers on all safety procedures. The degree course curriculum includes the management skills, emergency management, hospitality management, navigation skills, basic fundamental knowledge of aircraft and catering training. There are so many institutes in India offering the certificate programme,, diploma programmes and the degree programmes in the field of aviation leading to the air hostess and flight steward. Age Limit: Candidate age limit within 17 years to 26 years. Height: Minimum 5 ft and 2 inches with balanced weight. Status (Martial): Unmarried (Not all airlines have this condition). Eye Sight: Normal eyesight of 6/6 uncorrected in both eyes. Other conditions: Medical Fit, Having Indian Passport. How can i become an Air Hostess? You can directly apply in different airlines which give advertisements in national newspapers and other mass media. If you are selected then the airline organizes a screening process in which your height and weight measurement is checked. Then you have to appear for the entrance exam that is conducted by the airline. After you clear the examination, a main interview is conducted in which your language fluency, voice, personality, communication skill, and reaction to adverse situations is assessed. If you selected, then you are trained by airlines for six months. To make career as Air Hostess, your personality in addition to education is very important. An air hostess or cabin crew or flight steward is responsible to provide the welfare, comfort and safety to the travellers or passengers. They have to check the emergency arrangements before takeoff and landing the flight. They have also to check, whether the all facilities are properly adhered to the passengers. In this career you will meet with the cine celebrities, business tycoons, stay in 5-star hotels and shop from the big malls of the world and moreover you will see the different cultures of the world. As per the regulation no one air crew will fly more than 72 hours in a month. Means there is no work burden. It is a good industry to get the jobs and healthy salaries. 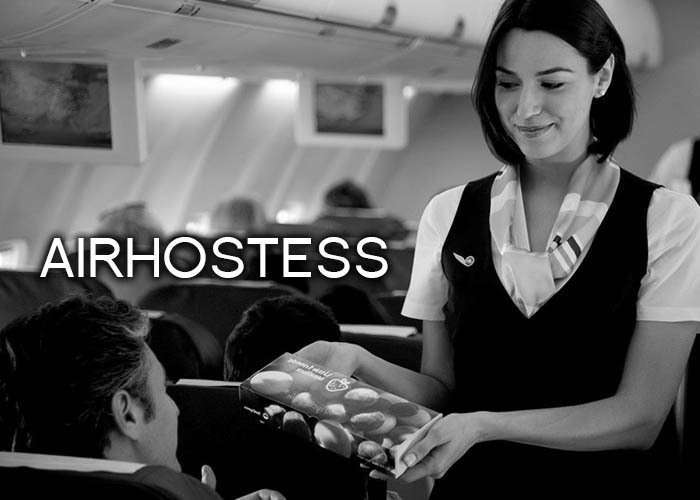 An Air Hostess can be later promoted as Senior Flight Attendant and then Head Attendant. hi i m Rachel and I’m gonna be 18 and being air hostess is what i dreamed of. My height 158cm and weight 48. Is it acceptable to be an air hostess. Please reply with a further details. your bios and language speaking are good enough. let’s make your dream true. to make your dream true you must have the fluency in English. yes, you can become airhostess, for this you have to meet the standards regarding your height, personality, communication…you can also join any good air hostess training academy for the same. I have given class 12,from commerce stream,my age is 17only,how to apply for AirHostess . do any course in hospitality or aviation and apply to the desired airlines. I completed 12th …..is airhostress trainning is difficult?..and swimming is compulsory? Not difficult. but swimming skill must not be there. I am haritha, can you give me full details of this course like course duration, fees, qualifications etc. I have just completed my 10th n my height is 5.6 and my eyesight is 6/6.i m good in english nw should I do diploma in hospitality…plz help me out I hav no idea!!! You did not mentioned your age but all above parameter are OK and you must do that. I do fit in all the criteria you have mentioned above. But I have tattoos on my hand so will it be a problem in future, can I be able to do the air hostess course and job? i have completed my 12 from science stream and now i m doing b.a(economics hons) 2year . sir i want to become an air hostess but my English is week. after completing my graduate can i apply for the air hostess and if i can then tell me what should i do . Yes. Nurse is the same profession like hospitality. But you should have to satisfy the other eligiblity norms for that. I’m currently giving my 12th class exams. As you have mentioned above that some airlines ask for graduation. WHat kind of graduation should i do? there is no mandate of graduation you may apply on the basis of your 12th but you need to have a crash course in aviation or airline or air hostess or hospitality. yes there are some airlines that require the degree in aviation or hospitality and management. Okay so if some airlines ask for the degree, then according to you, how much time will this degree take? As in that course will be of how many years? That will be a 3-4 year degree. Oh that will take too much time. Well thanks then. By the way, what is the best institute according to you? Sir I wnt too bcum air hostess jsT passedout mAe 12 frm commrce field I ned ur hlp plzz gvE me smee sugestion n plzzz reply……. Sir I wnt too bcum air hostess jsT passedout mAe 12 frm stream commrce I ned ur hlp plzz gvE me smee sugestion n plzzz reply……. I have passed 12 just now and I am interested in this field can I join that .my height is 5’9 ? you have a good height. you have to satisfy the other eligibility norms and you may join it. I have completed my 12th last year and now I want to do BMS.. and I am also intrested in air hostess career.. can I do the both courses together? Presently am writing my b.com comp final year an I wana become a air hostess so what will be the procedure an which courses will be suitable for me ? do the air hostess training course. I have completed my 12 th only in 2013….nd m unmarrid yet…..m totaly confused ..what should i do …i wanna be airhostes ……nd my ht is 5.4inch…….nd weight is 52 kg……can i do ?? Plz rply nd thnx.. Height and weight are OK. you should for for airhostess training course or diploma or degree in hospitality. You can achieve your aim. There are many short term courses offered by many air hostess training academies. diploma in hospitality, travel and customer service or training in air hostess all are OK. Currently I am working as a Software Developer. Looking for a switching to Air Hostess. My height is 158 cm. Can you please tell me how to apply for the same. I want to pursue the same for international flights. visit the official sites of different airways or check the classified news. height is OK but you should comply the other eligibility criteria. my question is that. how many percentage is required for air hostage in 12 th. and after 12th which course I have to do for air hostage. my english is very weak I only tallk in hindi that’s why my english is weak. plz reply my message plzzz sir .My dream is to become a air hostage ..
before replying your core query i just want to tell you that your English is OK as per you have written your question. Don’t deal with complex. Now, after 12th you may appear for air hostess with any percent marks mean there no require of specific percentage criteria. You must just do the crash course in air hostess training which will take 6 months to one year. sir plz tll me wht cn i do aftr +2 TO GET THIS job sir which course sir……..
get the short term course in air hostess training conducted in various cities or do the hospitality management. Hey…this year I will complete my 10…and my dream is to get job in airline so..plz tell me what can I do to get a job in airline..
Hello, i’m graduating from bms this year in April. I’m 5’7″5 and i have a normal eye sight. which course do i pursue to get paced in an international airline? In most of the metropolitan cities there you will find institutes offering the air hostess training duration of 6 months to 1 year. you may join that. beside this you can do the hospitality and management courses. You can pursue an air hostess training course from a recognized institute. You can either join Training programme, or you can apply directly. weight should be according to height. see the standard for that. Hello sir i am Debashi Karmakar my age is 18 My hight is 5”2 .is capable for air hostess?I am reading in B.A. 1st year so,after graduation can I apply for this job ? plz reply as soon as possible. I think the height criteria is 5’3. but you may check the height criteria for different airliner companies. currently I am pursuing my BE in electronics and telecommunications. my age is 22 .can i apply for this course and how ? If you satisfy the eligibility for Air Hostess then go for some crash course or certificate course in aviation, tourism or hospitality. My height is 5″4 . Is capable for air hostess. Plz reply fast. As soon .As possible. Currently I’m pursuing BCA. I want to know if I can apply for air hostess after completion my graduate. So what can I do this time. better if you get some training course in air-hostess or hospitality field. That will be fine to you for your future in air-hostess. Get a certificate or diploma of degree course in same or related field. sir i”m doing diloma in hotel management,nd tt”s my dream that I Want to become air hostess,,sir i want to know that after diploma wht i do for air hostessnd i also weak in english sir pls give me any suggetion sir pls,..i will wait your answer,.,.pls sir help me in it.,. be strong in english. education is quite better. get the proficiency in english and then apply. Yeah there is ample opportunities in hospitality and tourism sector, you can go for diploma courses or short term courses in the these to land a good job. You want to become an air hostess right? First there nothing like “HOSTEL” Management,that you have mentioned above. Now answering your question you must be at least 12th passed to become air hostess, there is no such eligibility like you have to do graduation or diploma in hotel management or aviation. Also if you are graduate (any stream) then also you can apply for air hostess, but what is important is your communication skills, physical appearance and body fitness, etc. Also if you have some sort of work experience in hospitality sector then it can be a plus point for you, Hope i cleared your doubt now. and thanks for questioning. So I m capable to become a air hostess hopefully you read my this comment and help me regarding this matter. Get the eligibility criteria of air hostess and evaluate yourself accordingly, if found ok then go ahead. I am doing b.sc. in biotechnology am I suppose to do diploma in hotel management or tourism .. And if I don’t do it will it affect the job opportunities for me??? ?… Plzz rply fast.. I request u sir.. There is good scope in hospitality industry but only if you have done your course from the right institute like IHM etc. If you wish to become in Aviation then that will be value to you. I had completed bsc computer science,i want to do air hostess but i didn’t know english fluently but i can speak english and other language also like hindi,gujarati,marathi.so kindly reply me. You must be having good command in English to become an air hostess, i think with practice you can bring fluency in your speaking. You can join some professional air hostess academy, which provide training in this field…also check the eligibility conditions for becoming air hostess. Their are many Airline training Academy which provide airlines training courses like cabin crew, hospitality staff etc. Hi i am in ba final. .i want to make my carrier airlines…so plz tell me wht tha course and how year bcz my age is 22 .
is 5.1 height is capàble for airline??? i want to make my carrer in airlines..and my eyesight is normal and my height is 5.1 is m i capiable for diz. sir is my height is capable for these course..
height is OK but your age must not exceed 25 year as on application date. My eyesight is weak n i m pursuing my 12 cmmrce m i eligible to this job??? It may depend on airlines to airlines, but if you correct your eye sight to the certain requirement set up by various airlines and don’t have other issues like color blindness etc, then you will be eligible for it. Also you have to produce a medical certificate from doctor and pass the medical test conducted by airlines. Weak eyesight is not an issue,there are other factors also to get a job in the travel industry. I have done my hsc and iam married having one baby but iam separated with my husband can I join for Airhostes course. Please reply. We respect your energy. you can but you will have to show that you are unmarried and for that you will have to make a distance with your baby and that is not fair for his/her future. so please in my opinion do not think so. choose any another field in which you can pay your time to your baby also. Yes, if you comply the eligibility criteria. then after 12th….. what do i need to study……..???.. can i join the air hostress…training….. after my 12th…..
Sir I want to apply for indigo as an airhostess but my maths is super weak. Like literally bad.should that mean I should give a second thought ? If you are interested in Air hostess then you can continue your career in this field. You have to strong your skills in English language. Yes you can join, After 12th. You can pursue any UG course as per your choice. hlo….sir i complt my +2 in steam offf commrce ….so sir can i join airhostress course …if ys… What can i do fr thz couse? after 10.grade… can i join… for airhosterss traning….. even if ma english and hind is not much good…..
No, you must be 12th passed or you must be having any short certificate course in either avaition or hospitality sector. secondly you must be having good command in both English and Hindi. yes you can apply, just work on your communication skills..
Hello sir,I been completed my 12th in 2006,and I can speak English, hindi,punjab,Malay, and tamil,can I apply for it? respected sir my height is 162cm and my dob is 5th july 1990… am i eligble for airhostess/? respected sir…. my height is 5.6 ft… and my birthday is 06 JUNE 1998…. am i eligble for air hostess……??? my is becomes air hostess…. OK but work on your language skill. hi. I m still persuing my b.com. can I apply for airhostess. for applying this what should I do for it????? For that click on the air hostess. You have to improve your English skills. Yes if you will comply the other eligibility criteria. im in fybcs can i apply for air hostess this year without compliting my fy ? Can we become airhostess without completing my bsc computers? now am in bsc final year but can we apply for airhostes without completing bsc now? yes you can apply. there is no criteria that a person should be a graduate for air hostess. can i take admission in air hostess institute after polytechnic 3rd year? is it necessary to give exams of 11th & 12th? Polytechnic programme is being considered as a diploma course in industrial professional. For appearing the air hostess programme you need to have the 12th pass certificate. First focus on you studies and score well in your academics..and then attend any good air hostess training academy…your height is ok, but you have to gain some weight..
you can pursue any UG course, if you like to pursue travelling courses then there are some short term travelling and tourism courses which you can pursue. and you can also pursue MBA in Travelling & tourism. For flying steward you must have good communication skills, good personality and min. 12th pass from any stream. after completion of your 12th. it a good career prospectus but you need to be complied the eligibility criteria. you should look to pursue your graduation and you can also apply for Air Hostess. respected mam/sir can u pz recommend a field for me of air hostress degree which earns more profit in short duration ..pz..! and also the qualifications marks required to pursue in this field ..! You do the 12th with maths (not mandatory) or any stream and get the admission to the B.Sc in aviation. there is no any criteria for minimum marks but get the rich so that you can cross hundreds of your competitors. i have completed my 12th last year..now i jst think to take admission in air hostess courier so can u plz tell me how i apply for it..
how many weight in air hostess job???? weight must be according to the height if you nearly complied the height then you weight should not exceed t0 50-52 kg. The standard is 45-50 kg. I just recently finished my high school and i want to become an air hostess so which course should i choose. great, first you need to get the higher education as B.SC in aviation or BA in tourism and hospitality. you may also join on the base of Intermediate but for this you will have to undergo the crash courses in aviation which will take 6 months after 12th. beside this maintain your height and weight because its matter. Eligibility for an air hostess training programme is plus two/ or a graduate degree with a diploma/degree in Hotel Management or Tourism Management. can i become airhostess after engineering? After engineering anyone can apply but around all aviation industries consider minimum height as 165 cm. sorry but true. I am in 9th class now , want to become air hostess . I want know how much it costs for air hostess training? See, As you told me that you are in 9th. right? SO, i think your age is around 15-16. Hey, you can achieve more height within next 2-3 years. do some sort of exercise. Although, the minimum qualification for air hostess is 12th and accordingly you have three more years to prepare yourself. You can. we hope. If you are selected by any airlines, they will offer training with no peny. But if you wish to prepare at your hand you have to bear the expense around 25-30K for training. Im doing diploma after 10th. And now im in last year of diploma in IT(Information Technology). Im 18years old. Can I do the air hostess course now? Is there compulsion for 12th? If you are having a polytechnic diploma then it will be considered as the 12th equivalent. What can we do?? After diiploma to became an airhostes?which courses ?? ? Cn u tell me about it in detail…. you can either apply directly, or you can take training from various training academies. i am married… and i want to be the air hostess but u had mentioned unmarried only can apply for air-hostess training.. i am want to do this. can i …plz reply soon. but it is a norm for air hostess. yes if you have experience of minimum 2-3 year then only you can apply even if you are married. All the details about air hostess, we have already mentioned above. I’m doing my 12th …and my personality…but im not version…. I hav completed B.E.ButI am interested to become an air hostess. Is there any possbilities for me, now my age is 22.Is there any short term courses. there are so many short term courses from 6 month to one year and you may go to these courses. before appearing the course and applying for the air hostess you should go through with the eligibility criteria of air hostess. i am currently pursuing bsc in science.I want to know if i can apply for air hostess after completion of my course. kindly send me details regarding the same. I’ve completed my 12th in 2013 .I’m 5’10” age 19. Doing a diploma degree in aviation, hospitality and travel management from a reputed institute, can help me getting a job after diploma . And one more thing does aviation sector hold bright future for male candidates. Yes, job opportunities are provided by many Aviation companies…so you can apply for that job after completing your course. I am currently pursuing Bsc in Hotel management from IHM Mumbai. I want to know if I can apply for air hostess after completion of my course. Kindly send me the details regarding the same. Yes you can apply for air hostess, but you must full-fill the eligible criteria. Also, if you really interested in the aviation field, a short term course in air hostess or flying steward will be helpful. My daughter is pursuing her B.Sc in Hotel Management in Mumbai. Can you guide me on the short term courses offered in Mumbai for air hostess or flying steward and where are the courses held in Mumbai. There are many air hostess training institutes that are offering short term training courses in air hostess. you can contact them and get entrrolled for the course..
Sir i have completed my b.scin biotechnology..after that i want to apply for air hostess…bt i cnt get proper information..can u plz give me proper information..how can i get admission in air hostess plz. i m bhagyashree.. N m persoing aviation and hospitality managment.. N yes, i m must full-fill the aligible criteria and i m also intrested in the aviation fild.. So pliz help me..
Air hostess job is direct or placement . i will talk to rs-300/charges on writing exam. 22 may 2015 my exam at delhi…. yes the training academies charge the fees from the students, these institutes starts their batches round the year, yes you can pursue it after b.com. yes you can apply as a flying steward. yes you can apply for Flight steward but after 12th, there is certain criteria that you have to fullfill like Height 170cm, good communication skills and so on. There are many airliner companies which invites application from time to time you can directly apply their. You can enter this field as a flying steward, for that you need to have good comm. skills, good height and good personality. You can also apply directly to various airliner companies. can u suggest which institute is best for air hostess courses? Is the short term course enough to be air hostess in international flights or you need to do the diploma course and how much duration are the short term courses are of ? And also the approx fee structure would be ? The diploma courses are always handy. I’m taking about Air hostess training course. It will be good if u have diploma in hospitality or aviation management. training period duration can be ask? it is true that without knowing English language you cannot sustain as air hostess. you can read the article above, if you’ve any query you can ask us. Now i am 12th science which cource help to me to beconm airhostess. either hospitality or air hostess course conducted by reputed flying institutes. You must do at least 12th for this job. Including you can get the air hostess training also. You can do this job till the age of 35 around. Dear sir i had completed my B.sc aviation .My Aim is to become an airhostess. So ,please let me know now what can i do. ?